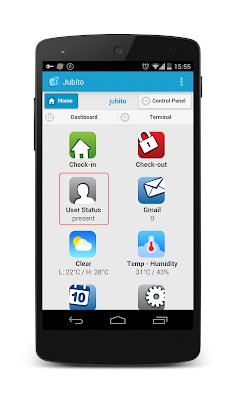 A nightly version (1.1) of Jubito client app is available for download. 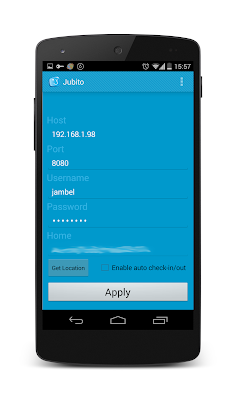 The most significant addition is the geo location based user status according the home location. In Jubito settings you'll find the button "Get Location". This will retrieve the current location of you at the time you press it. After applying settings and if you enable the feature from the according checkbox, it will be activated when app is running. The specs for the task is to check when location is changed in a span of 5 seconds, over a step of 25 meters and at a radius of 500 meters against the home location. If you're located within radius, it will trigger the %checkin% function corresponding to your registration and vice versa (%checkout%) when you go ahead. Check more on built-in functions. Please feel free to report bugs or any extra additions.